This is a question that gets asked to every Financial Planner from almost every client and prospect they ever meet. The problem with this question is that not one of us has any idea how much money you are going to make, or what your rate of return is going to be. If you find someone who tells you that you WILL get a specific rate of return, ask yourself a simple question. Do you think your financial guy knows how to predict the future? If you think the answer is no, which I hope you do, then walk away from that guy and never go back to him. A lot of people love the idea of quick and easy money, so they get sold on past performance. Just think about how many people want to buy Bitcoin right now, because it's going on a tear. Will that continue? One can only speculate, because I know that I have no idea. If someone promises you an incredible rate of return, ask them if they have leveraged their house betting on it. If they haven't, then don't trust them. Terrible advisors will do this to people they meet. They will convince people to move money to them on the basis that they somehow know which investment is going to outperform the next guys. So, they will look at their product shelf and find the best performing fund they have from the previous year, or the previous few years and tell you to buy that, because it returned 26% last year, or 11% over the last 10 years, or whatever number that may be. You understand that you'd probably be better off being sold on buying an investment that has been down over that time period right? But, even that is just speculating and you should not invest on the idea of speculation, unless you have money to burn in a garbage can. DO NOT BUY INVESTMENTS OFF OF A GUY WHO TELLS YOU THAT HE CAN GET BETTER RETURNS THAN THE NEXT GUY BY PICKING THE RIGHT INVESTMENT. There is a regulatory body called the FPSC (Financial Planning Standards Council) and they just sent me an information package regarding this exact question. They have set out guidelines for what we should tell people our projection assumptions should be. Remember, these are just assumptions, because they don't know what the market will do either. The market could do much better, or it could do worse, but these are the numbers we are supposed to use in 2017 when we make long-term assumptions about rates of return. I hear this a lot, "My guy told me I am getting 6%." What usually happens when people hear this is they think that they are getting 6% a year guaranteed, or that's what their actual portfolio is doing. Whenever we give projections, or estimates, that does not mean that's what you're getting and it definitely doesn't mean that you can expect that rate to stay steady every year. Your portfolio is going to lose money some years. Other years it will basically do nothing. Some years it will do close to what we said you can expect. Other years it will get good returns above what we said you can expect. And lastly, sometimes you will see fantastic annual returns. When all is said and done, we hope that your portfolio returns an amount close to or above what we suggested you would get. Every person has a different risk tolerance, which is why we make you take those questionnaires, and higher risk means you hold more equities (stocks), so you can expect a higher long-term rate of return. 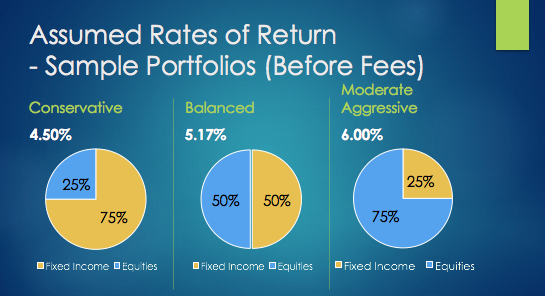 Below is a chart of three sample portfolios and the rates of return we are supposed to tell you to expect. 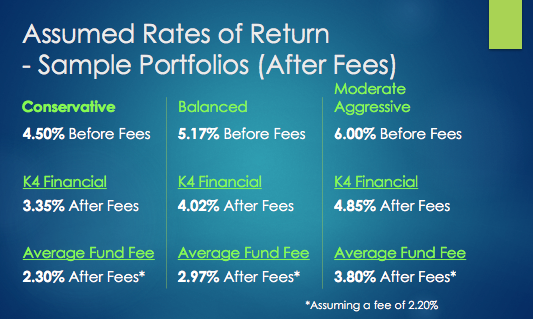 You see those rates of return and you think to yourself, those sound pretty good for long term investing. However, please note that these projections have not taken into account the fees that you'll have to pay. If you want to do it alone and know how to build a portfolio, you can project returns close to this for yourself. If you want to just use a RoboAdvisor, then you can project these returns minus about 0.70% (depending on asset value and the company). Your average bank fee is 2.20%. Some are lower and some are higher. Now let's look at what we're supposed to show you to expect. How Many of Your Advisors Are Telling You to Expect 3.8% on Your Moderate Aggressive Portfolio? I would bet that none of them are, because who would invest with them if they told you that? But that's what the guidelines say we are supposed to suggest. So why has your guy told you different? Because they can basically say whatever they want to try and persuade you to invest with them. So, what should you do to avoid this? Work with a super hilarious, incredibly truthful, relatively handsome, Certified Financial Planner Professional named Kent Tilley.